Tandem Trades is a proudly locally owned and operated Sutherland Shire based business that has been supplying our commercial & industrial customers throughout Sydney with quality roofing and carpentry services for over 25 years. The main focus of our roofing business is metal roof installation and repairs, especially Colorbond and Zincalume metal roofing and flashings. we also specialise in polycarbonate roofing, fascia gutter installation and repairs and innovative roof ventilation solutions. We are very experienced in insurance work as well as new to-specification projects and have built a reputation of reliability and integrity in all of our work - and you are guaranteed the same level of attentive service, workmanship and competitive pricing that we stake our name on. We are fully licensed and accredited roofers (license number: 103 110C). 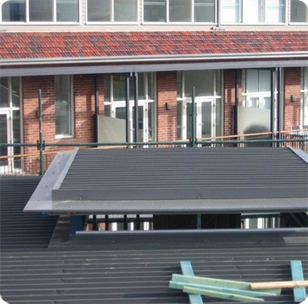 We specialise in providing smart, good looking and cost-effective metal and polycarbonate roofing solutions for all Sydney industrial buildings including factories, plants, silos and warehouses. As well as being the metal roof repair and installation company of choice, the team from Tandem Trades are also skilled and experienced carpenters, available for small to medium projects around your Sydney business. Contact us today to discuss your industrial carpentry needs. When you call Tandem Trades, you are calling a company that you can trust. Along with friendly service, reliable and efficient professionals and competitive prices, we stand by all of our work and give you a full guarantee on the materials we use and the services that we provide. We provide industrial new metal roofing, roof repairs, re-roofing, and roof ventilation services throughout greater Sydney, including Sutherland Shire, St George, Inner West and the Eastern Suburbs Sydney. For an obligation free quote and evaluation of your needs, please Contact us today.